If you haven’t tried foil packet cooking, you are in for a real treat! Preparation only takes a few minutes and clean up is a breeze. You can use this method indoors year round, or toss the packets onto your barbecue to enjoy a light and healthy meal during the warmer months. 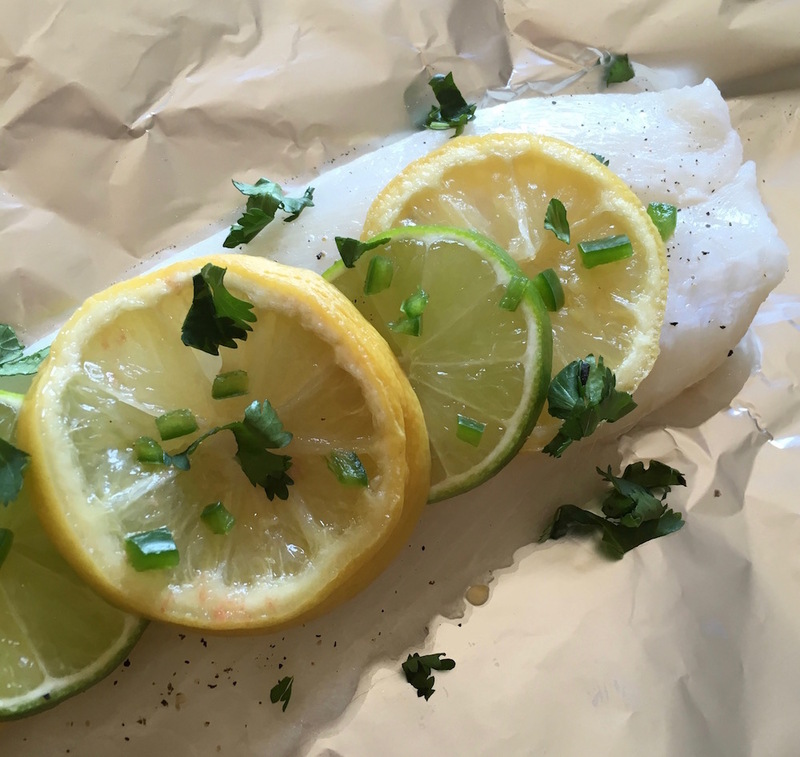 This recipe uses sole fillets, but this technique can be used with any type of fish such as flounder, haddock or other flaky fish, lean protein and veggie combination. You can use fresh or preserved lemons to make this recipe. I recommend trying the preserved lemons because they add a lot more flavour. You can either buy a container of preserved lemons or easily make your own with Himalayan salt blocks. A word of caution, however, if you use preserved lemons, don’t add additional salt to the fillets without tasting. If preparing indoors, preheat oven to 200C / 400F. Tear off 4 sheets of aluminium foil into sections large enough to fold over fillets, with another couple of inches on each side to seal. Place a fillet slightly off centre on each sheet and add 3 lemon slices and 2 lime slices on top of each. Top each fillet with ¼ of the coriander and jalapeno pepper. Top with 1 T. of butter and sprinkle with salt and pepper, to taste. To seal packet, fold aluminium foil in half over the ingredients. Fold the 3 open sides, one at a time, over several times to seal the packet completely. The goal is to seal the packet tight enough to hold in the steam, but allow enough room for the air to expand. Place foil packet in preheated oven for 15 minutes, or place on hot grill over medium, direct heat and cook for approximately 8 – 10 minutes. Add a couple minutes to your cooking time if starting with frozen fillets.